FORT WORTH, Texas – A sold-out crowd celebrated the Davey O’Brien Foundation’s 2017 award winners Monday night at the 41st Annual Davey O’Brien Awards Dinner at The Fort Worth Club. 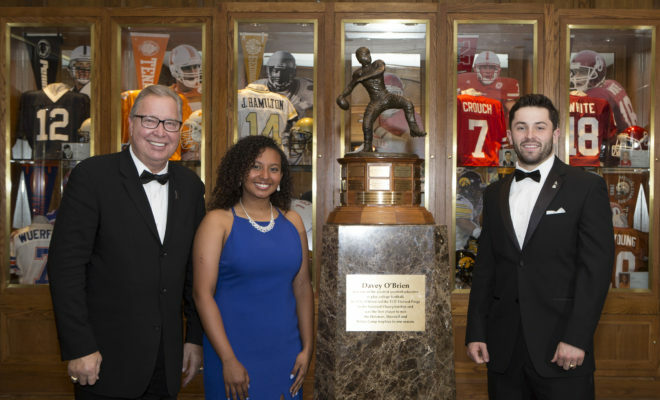 The evening’s honorees included National Quarterback Award winner Baker Mayfield, Legends Award honoree Ron Jaworski and High School Scholarship recipient Mikayla Wilson. Prior to the dinner, Mayfield made the rounds with Fort Worth/Dallas media members. In addition to the press conference with the award winners, Mayfield conducted live interviews with WFAA, CBS 11 and NBC 5, and made an appearance on 1310 The Ticket’s afternoon show “The Hardline.” Mayfield also sat for a media roundtable with members of the Associated Press, Fort Worth Star-Telegram and Dallas Morning News. The Davey O’Brien National Quarterback Award was first issued in 1981. On Monday, Mayfield became the third Sooner player ever to formally accept the nation’s oldest and most prestigious quarterback trophy, joining Jason White (2003-04) and Sam Bradford (2008). He is the eighth quarterback winner from O’Brien’s home state of Texas. In 2017, Mayfield passed for 4,627 yards and 43 touchdowns, and also rushed for 311 yards and five scores. His single-season passing efficiency rating of 198.9 broke his own all-time NCAA record. He led the nation in passing efficiency, points responsible for, completion percentage and yards per pass attempt. Mayfield also ranked among the NCAA’s top five in passing yards, passing touchdowns, total quarterback rating and total offense. Jaworski became the 17th winner of the Davey O’Brien Legends Award, which recognizes a college or professional quarterback who has made a significant contribution to the game of football, distinguished himself as an extraordinary leader and demonstrated exemplary conduct both on and off the football field. Jaworski spent 17 seasons in the National Football League after being selected by the Los Angeles Rams in the second round of the 1973 NFL Draft. He played for the Rams, Philadelphia Eagles, Miami Dolphins and Kansas City Chiefs. In 1980, Jaworski was named the Bert Bell Award winner as the NFL’s top player after leading Philadelphia to an NFC Championship and the first Super Bowl appearance in franchise history. At the time of his retirement, he held the all-time record for consecutive starts by a quarterback with 116, a figure that now ranks seventh. From 1990-2017, Jaworski served as an NFL analyst on ESPN, working on such broadcasts as Sunday NFL Countdown, NFL Matchup and Monday Night Football. Wilson became the 31st recipient of the Davey O’Brien High School Scholarship, which is awarded on the basis of character, community service, leadership, scholarship and varsity sports participation. Wilson is ranked first in her class of 361 students at Trimble Tech with a 4.46 grade-point average on a 4.0 scale. She is a two-year President of the National Honor Society and a member of Key Club International. In addition, she has received major awards from the FWISD four times, as she was named a Superintendent Scholar and also collected three Ann Brannon Awards. Wilson has competed on the Bulldogs’ varsity softball team since her freshman year, and is a three-time all-district performer heading into her senior season. She also participated in volleyball for three years. Six former Davey O’Brien National Quarterback Award winners were in attendance, including Silver Anniversary recipient Gino Torretta (Miami, 1992). The others included Jim McMahon (BYU, 1981), Don McPherson (Syracuse, 1987), Ty Detmer (BYU, 1990-91), Brad Banks (Iowa, 2002) and Jason White (Oklahoma, 2003-04). The awards are overseen by the Davey O’Brien Foundation, which is headquartered in Fort Worth, Texas. The Foundation has given away more than $1 million in scholarships and university grants to help high school and college athletes transform leadership on the field into leadership in life since its founding in 1977.